On Saturday went out for the first Macro outdoor shoot of the year, and took a new experimental diffuser setup with me in the hope for some solitary bees at White Mill river path. The new diffuser I made out of a recently used poppadom box with some vellum paper – more of it in a later post. My general hope was it would work in a the form of a light tent way. The afternoon started of fairly warmly – so went out with just a light jumper on – something that I regretted later as the temperature dropped later on – along with the presence of many of the insects – who sensibly went home I think! I did find some insects before the weather changed, including my main targets some solitary bees. The one in the first two shots below, was particularly placid, and posed for several shots and allowed me to set up a false blue sky – with a blue card background. 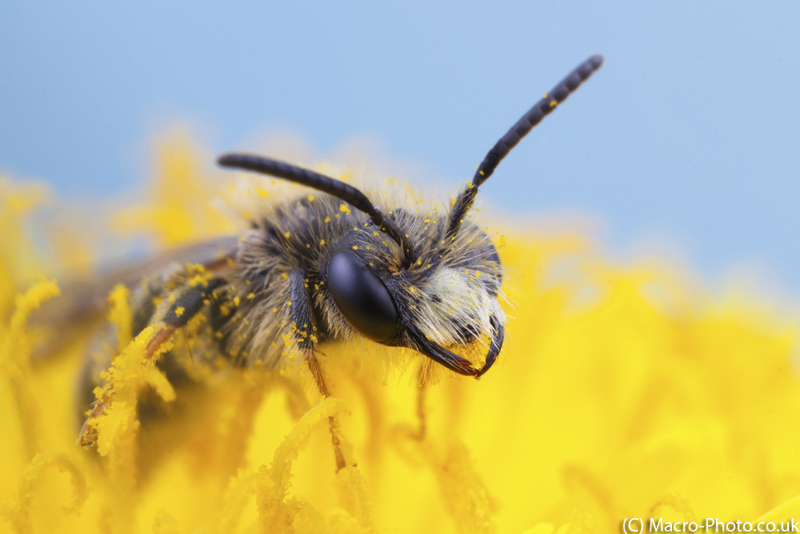 Solitary Mining Bee with Blue Sky (About 2x Mag). Taken on Canon 650D & MPE-65mm at F11 ISO 100 1/200. Flash from MT-24ex with Poppadom diffuser. Blue card in Background. Solitary Mining Bee with Blue Sky at 3x Mag. Taken on Canon 650D & MPE-65mm at F11 ISO 100 1/200. Flash from MT-24ex with Poppadom diffuser. Blue card in background. 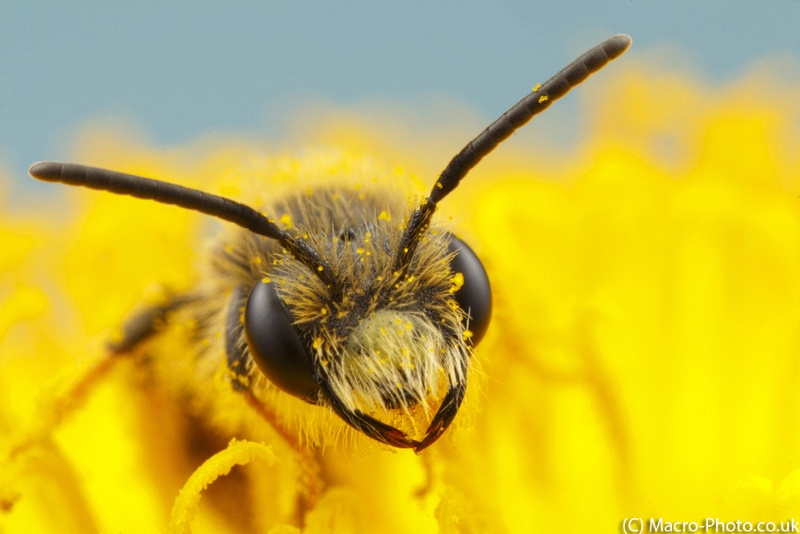 A further subject emerged into view from a Dandelion flower, in which it was diving around in for the nectar an allowed this shot of it. 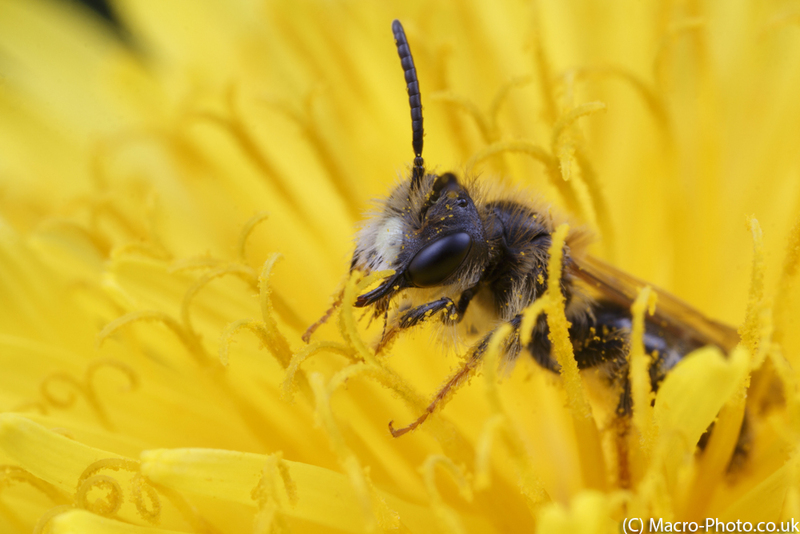 Solitary Bee in Dandelion at around 2x Magnification. Taken on Canon 650D & MPE-65mm at F11 ISO 100 1/200. Flash from MT-24ex with Poppadom diffuser. I also was lucky enough to spot this male Orange Tip butterfly hanging around under a flower. As I only had my MPE-65mm with me on this trip, the most I could get on frame was this head and body shot of it. 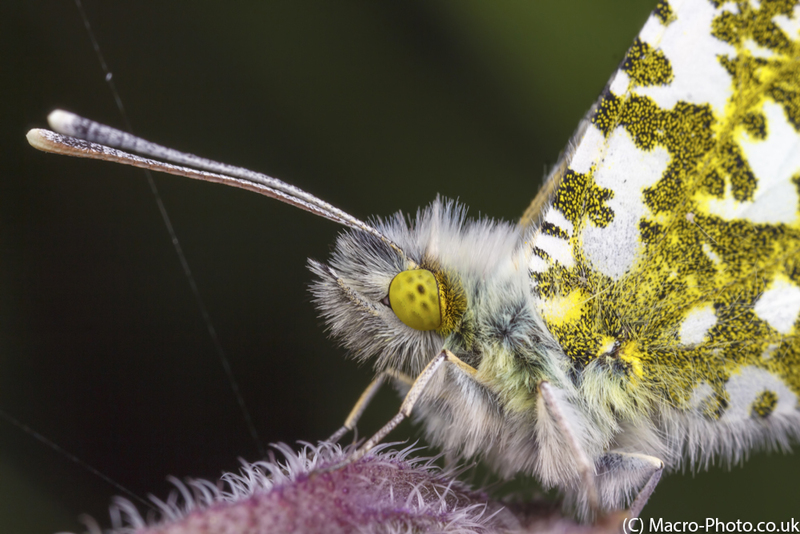 Male Orange Tip Butterfly at around 1x magnification. Taken on Canon 650D & MPE-65mm at F11 ISO 100 1/200. Flash from MT-24ex with Poppadom diffuser. 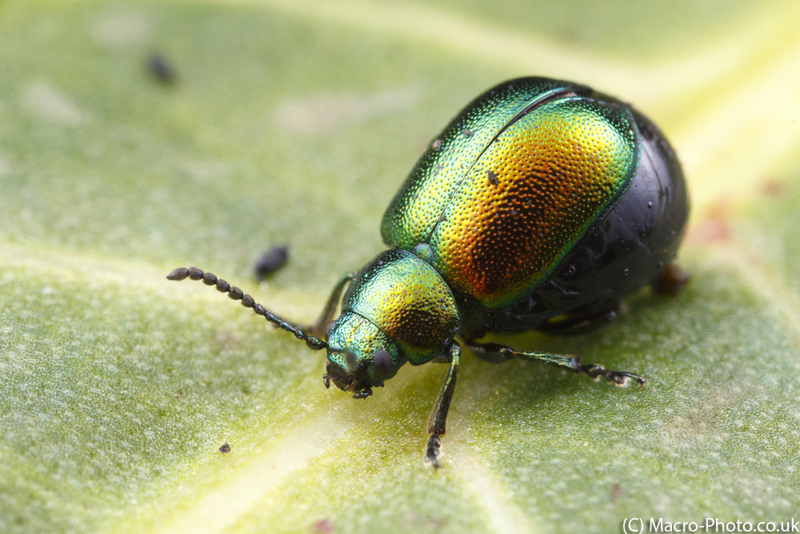 There was also a lot of Doc Leaf Beetles about – including the one shown below. 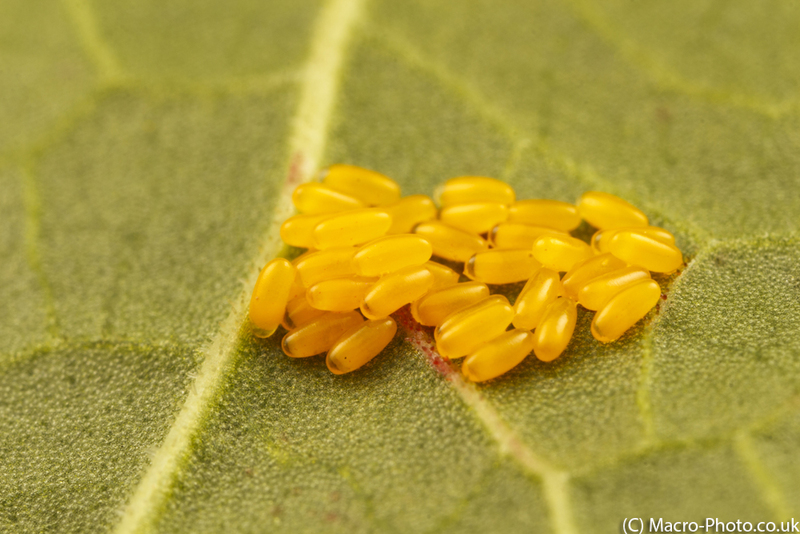 I think the eggs on the Doc leafs are from these beetles too. Doc Leaf Beetle at about 2x magnification. Doc Leaf Beetle at about 2x magnification. Taken on Canon 650D & MPE-65mm at F11 ISO 100 1/200. Flash from MT-24ex with Poppadom diffuser. Beetle Eggs on Doc Leaf at 2x magnification. Taken on Canon 650D & MPE-65mm at F11 ISO 100 1/200. Flash from MT-24ex with Poppadom diffuser.